“At Missiska farm we raise a herd of Jersey cattle with care, pride and passion. Fed on hay grown at our farm, they produce a plentiful creamy milk, ideal for producing cheese. Made from “the champagne of milk,”, with no added preservatives, our Jersey cheeses melt in the mouth. You’ll flip for their flavors and texture! Discover our other products, too: yogurts and a non-homogenized milk. Creamy texture. Fresh-cheese taste, less salty than other cheddars on the market thanks to a slow cheddaring carried out by hand. Flavors of butter and cream. Milky taste, rich and creamy. 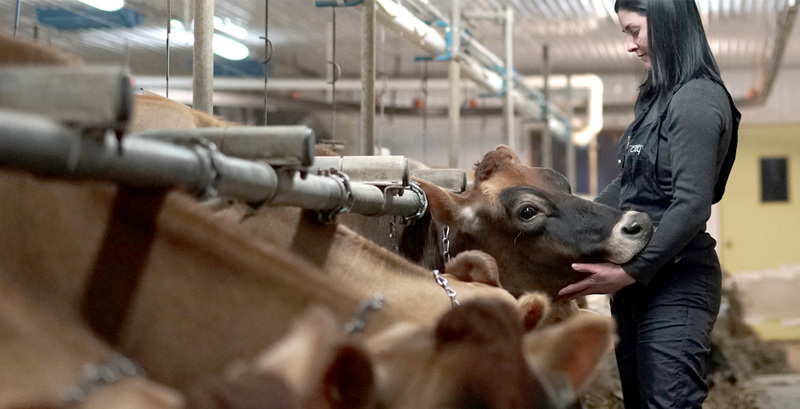 At Missiska farm we take great care in raising a herd of about 60 Jersey cows, 35 of which are milking. Their well-being, the quality of their milk, and respect for the environment lie at the heart of our business philosophy. Visit our cheese shop / boutique, located in Bedford (Eastern Townships), to discover the entire range of Missiska products, some of which are available there exclusively. Interpretation activities, tastings, locally sourced products, prepared foods and a picnic area are all waiting for you on site. A hugely successful launch for the Missiska cheese shop! The Jersey breed: one of the world’s oldest!